We all know the feelings towards this season so no need to rehash what has been said a HUNDO times on the blog and in the comments. To Sum it up for me this season had a awesome beginning the cast had so much potential but that potential/excitement dissipated 1/3 of way through. Not the best season not the worst.. 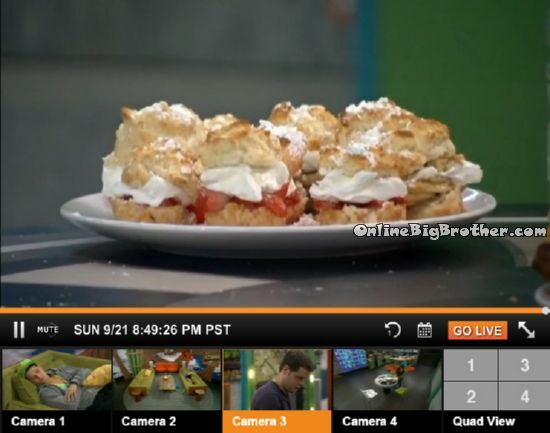 They hope Big Brother lets them listen to music tomorrow morning today they didn’t even after Victoria Begged them. Cody says if Caleb tries to go after his sister he’ll kick Caleb in the back of the head. 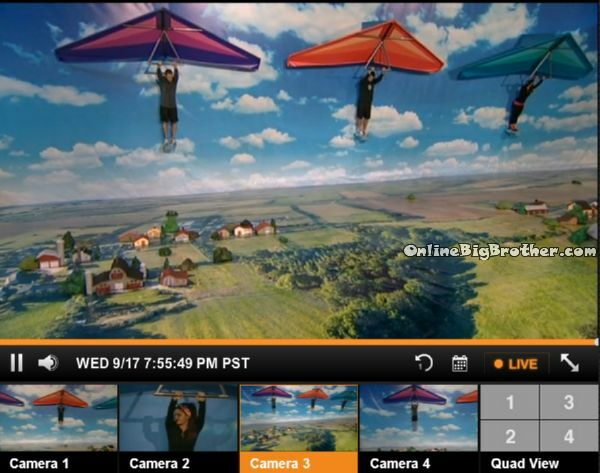 Derrick – it is bitter sweet it’s coming to and end i’m excited to see the family but i’m going to miss the place a lot of good strategy.. in the hammock.. a lota game talk..
“Looking out the sliders seeing people talk game over here.. endless games of pool.. hot tubing it and the pool. 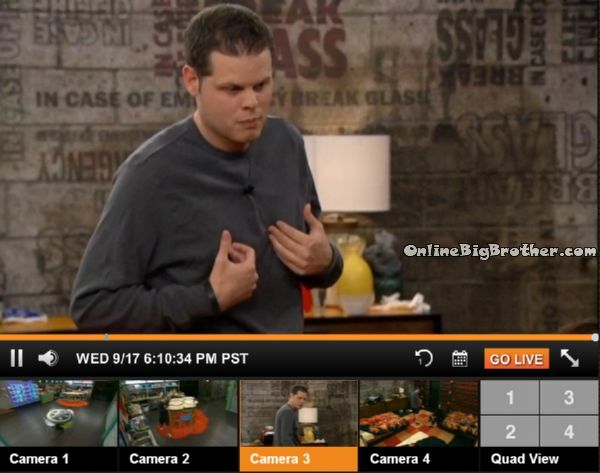 WOW..
Derrick tells the camera – Guys if you are single late 20 early 30 Jewish not a virgin but hasn’t slept with too many people.. is all about spoiling their wife or girlfriend and treating her the princess she is.. Hit her up on twitter..
Derrick talking about about how it would have been just as awkward if Caleb was there. 1:10pm Cody keeps himself occupied while waiting for the torture to end. 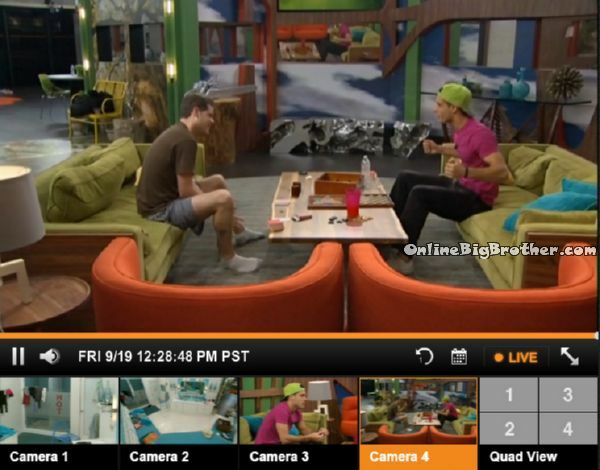 12:20am In the kitchen – Victoria and Cody continue to talk. Cody says that he wanted to send home Caleb week four but that Derrick said Brittany has to go. She knows how tight we are we have to send her home. So I didn’t put up Caleb and unfortunately my love of this game went home week four. And then after that it was supposed to be Caleb but Amber was starting to start an all girls alliance. So it switched from Caleb going home to Amber. Victoria says she remembers. Cody says after that you really know what happened after that. 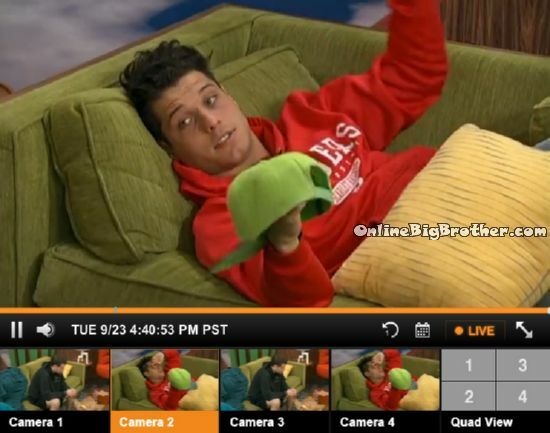 After that Frankie wanted Zach to go and I said no! Because anything Frankie wanted I wanted to go opposite. Victoria says that she heard Amber was fighting to get me out. Cody says no, she never would have. Who told you that. Victoria says Pow Pow and Nicole.